Hello! This week I will be in Salt Lake City for work. I'll be gone until Sunday afternoon, so, like alllll week. I thought about setting up a meal train for Jordan so he wouldn't just eat rice and ramen every day, but then I decided it would be much more fun to leave him to his own devices. So yeah. Wish him luck. 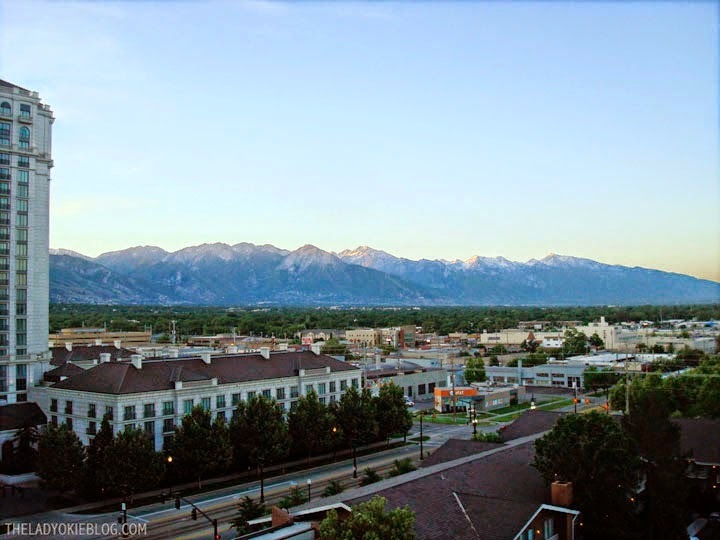 That picture above was the view from my hotel room when I went to SLC back in June, also for work. I have meetings and sessions scheduled, so my access to blog emails will be sporadic, if possible at all. I did schedule another vlog to post on Wednesday answering some more questions I got from you guys, so check back for that! Hopefully I won't have the same issue as what happened last time I went on a business trip to Salt Lake City. It definitely helps that I've already been on one trip, so I sort of know what to expect. Still, I would appreciate any prayers for safety and that I won't stress out! I'm leading two different meetings, and I hope everything goes well. 1) Another Blog Talk post! I have the topic already, but I'll keep you all in suspense for now. 2) Linking up with Jenna and Anne for a "Currently" post on March 4. 3) A review and giveaway of a healthy and delicious snack as part of the Sweat Pink Ambassador program. 4) Answers to more of the "Ask Anything" questions. I told you I got a lot of good ones! You can see answers to the first set of questions here. The comment box is still open if you want to ask a question. Totally anonymous. Today I thought I would share some current life updates and favorite links from around the web that I've come across recently. Enjoy! 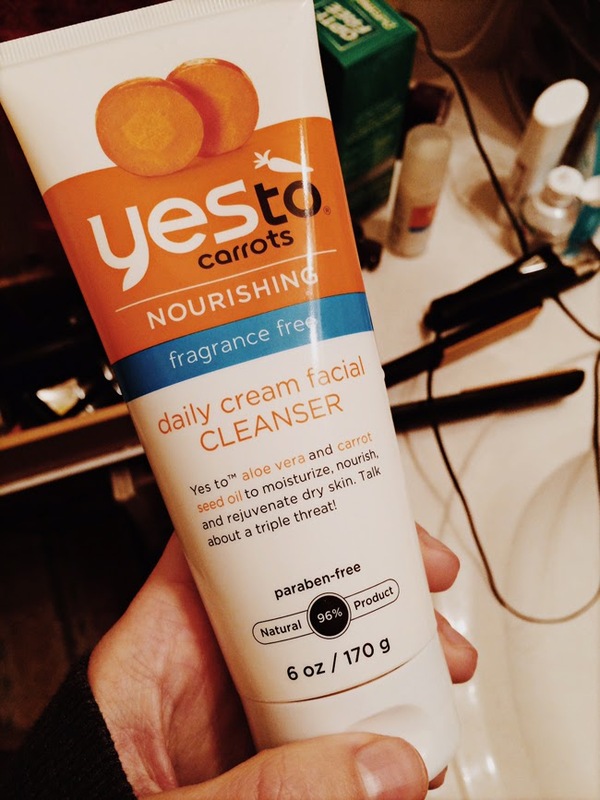 Recently, Tracy posted about a brand called Yes to, and after checking it out online I decided to order a facial cleanser and night cream from the Yes to Carrots collection to try out. It's 96% natural with no SLS (yay!) and no fragrance (which is another harmful chemical found in a lot of lotions and such). Oh my word. You guys, I love this stuff! Even Jordan loves it. He's washing his face regularly for the first time since high school! He says his face feels so clean and not dry at all. I've loving the night cream as well. Definitely recommend if you're looking for a more natural product line. -I look forward to these monthly desktop calendars and have been using them on my work computer for about a year. Aren't they gorgeous? -This article about singleness is fantastic. I'm not single, obviously, but I still appreciated the article and shared it with some single friends of mine, who liked it too. -My dad started a podcast recently! If you want to, you can check it out right here or here. -This Pinterest board has a lot of thought-provoking posts if you feel like browsing around. -Sarah's post on contentment totally resonated with me. -I am encouraged, inspired, and let's be honest a little convicted by Rachel's passion for sharing about Jesus. -A few weeks ago I made this recipe I found on Pinterest, and it was Jordan and Amanda approved. Super easy and delish. Officially added to my "Entrees I've Tried and Liked" board. -I finished my Project Life pages for January and couldn't be happier. This is so much fun! I plan on sharing my pages soon. I know some of you said you were interested in seeing some updates throughout the year. Find out more about Project Life here, and there's also a digital version (and an app!) for those of you techy people. -Stationary, hand-lettering, and cute cards are my kryptonite. Especially when they're from Etsy. Because Etsy. Currently loving this, this, and this. See you on Wednesday for another Q&A vlog! And please excuse me if it takes a few days for me to answer comments. I blame the mountains. Thanks for sharing the links to love. I was especially encouraged and challenged by Rachel's post about why she goes to her gym and also about the post on singleness. The blog on contentment was also a well timed reminder of God's work in and around, so often in the background but finding purpose in the preparation and work God has called me to in the foreground. Thanks for sharing so much encouragement through your own words as well as the words of others. Praying you have safety in travel and a good week at work in SLC. I wish I could take all the credit for the Yes To discovery, but I have to give credit to Alyssa (alyssagoesbang). Glad you and Jordan both like it! Hope your business trip goes well! This was so fun!!! I like the posts and links. Also, I gotta know more about the Project Life! It looks like so much fun. I downloaded the app but still haven't looked at it much. I'll pray for you as you go on your business trip. I know The Lord will help you and I hope you have a lot of fun. I'm a huge fan of the Yes To products! So clean and fresh! Enjoy your trip - and stay warm! Those mountains can be pretty darn cold! Good luck, Amanda! Everything will be fine, I'm sure of it. Hoe you have a successful trip! So cool your Dad has a podcast. I have a few of the Yes to lip balms but haven't tried the cleaner, i'll have to check it out. Have a fun business trip!! I hope you have no unpleasant surprises this time! Yes To is my favorite! It's like once you've been informed about how dangerous some things are for your body, you just can't keep using what you normally do. Enjoy the travels! :) I might have to look into YesTo. My face has been feeling EXTRA dry after just switching face washes recently and I'm hating it! Thanks for the recommendation. AND I'm hopping over to get that desktop wallpaper too! Looks like you a lovely view from your hotel! I did some research on shampoos a while back and started using L'Oreal's Sulfate-Free shampoos...I love them! For a while before I switched to L'Oreal, I did try baking soda in addition to my normal shampooing to try to get rid of dandruff--and it worked ok for a time. Never thought of using it by itself, but whatever works! The desktop calendars are beautiful! Safe travels and good luck! I love Utah and I hear it's oddly warm there right now. I recently converted my husband into a face washer as well. He was using plain old bar soap (say what?!) and was breaking out like crazy. We use Burt's Bee's Sensitive Fragrance Free (I'm allergic to perfumes) Facial Cleanser and really like it. For when he breaks out, I bought him The Body Shop Tea Tree Oil cleanser which works great as well. What would they do without us? Good luck on your trip! And thanks for sharing the links! Checking some out now! Mmm, I could eat some of that chicken fajita casserole right now. Looks tasty! Enjoy SLC - stay warm! Whoaaaaaaa! I need to try that carrot stuff! My skin and I have have not been getting along and I have been thinking about getting a new face cleaners. That stuff looks really good! About the lotion and cleanser, I'm going to have to try that! I've been looking for a new and natural cleanser because the one I'm using now just dries me out. Why is that chemical bad? I'm intrigued by that facial cleanser! I'm looking for something new!! 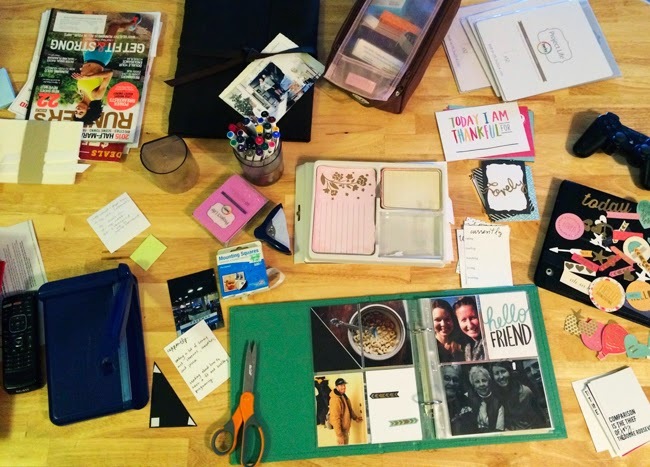 And I'm so glad you posted about Project life I've been wanting to try it for ages and now that Aiden is here I feel like it might be the only way to keep me scrapbooking. Can't wait to see your pages!